A 16-year old male presents to the emergency department (ED) after a potential exposure to a bat while sleeping in a barn. He believes his friend may have been bitten by the bat, but did not have any known contact with the bat himself. The bat could not be found after the incident. The patient has not noticed any skin changes and has no other physical complaints. On exam, the patient is well-appearing and in no acute distress. Heart, lung, and abdominal exams are normal. Skin is warm and dry without rash or lesions. What is the appropriate next step in management? A. Administer rabies vaccine and immunoglobulin. B. Contact public health authorities. C. Discharge the patient home and advise him to return if he develops any further symptoms. D. Reassure the patient/guardian with no further treatment. 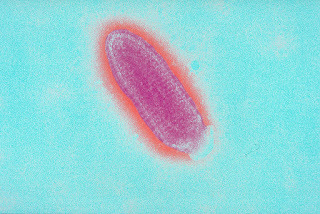 Rabies is primarily acquired from the bite of a rabid animal, and is nearly universally fatal, with only nine documented survivors. Often, there are prodromal symptoms, such as fever, myalgias, weakness, fatigue, vomiting, and headache, but because these are nonspecific, they usually do not aid in diagnosis. Clinical rabies can manifest as encephalitic, which is more common, or paralytic. Symptoms of encephalitic rabies include hydrophobia, opisthotonos, and agitation, as well as aerophobia, which is pathognomonic for rabies, but occurs less often than hydrophobia. Paralytic rabies presents with ascending flaccid paralysis, often most severe in the bitten extremity. Both types of rabies almost universally lead to death within a few weeks. In the United States, the predominant reservoirs are skunks, raccoons, foxes, and bats. Infection can be prevented with post-exposure prophylaxis (PEP). 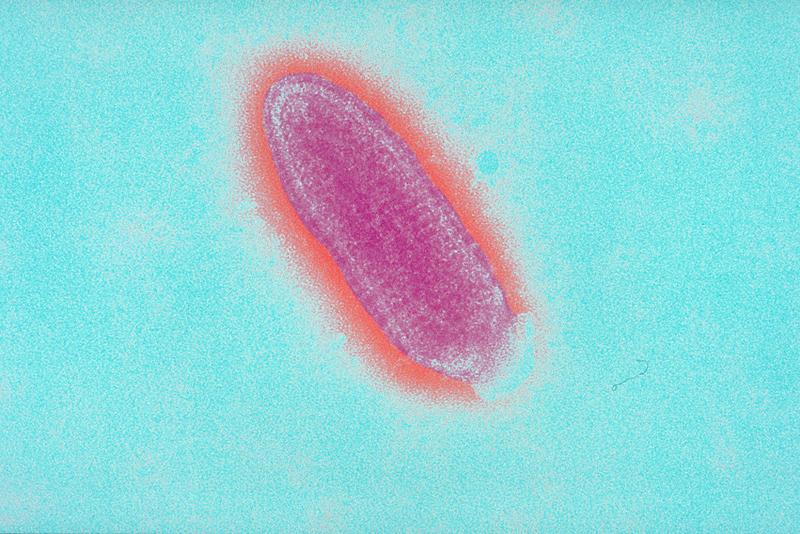 When a patient has a potential rabies exposure, several factors must be considered before administering PEP: the type of exposure, whether the exposure was provoked, the species of the animal, and the vaccination status of the animal. Additionally, PEP initiation depends on whether the animal can be observed or sacrificed for rabies testing (Figure 1). While this patient does not have a known bite or open wound exposed to saliva, he was sleeping during the potential exposure, and therefore physical contact cannot be ruled out. Bats are considered high-risk wild animals. Because the bat could not be located, it is not available to test for rabies. Therefore, PEP—rabies vaccine and immunoglobulin--should be initiated. Contacting public health authorities is indicated if a patient is exposed to livestock or an unknown wild animal (choice B). Discharging the patient home and advising him to return if he develops further symptoms is inappropriate, as rabies is nearly universally fatal once symptoms manifest (choice C). If the patient was exposed to a low-risk animal or pet, PEP is not indicated (choice D). Once the decision is made to initiate PEP, it should be initiated as soon as possible after the exposure, but should still be given if there has been a delay between the exposure and the patient’s visit. Prophylaxis includes both the rabies vaccine and immunoglobulin. The immunoglobulin provides actual antibodies, a type of passive immunization, which are protective in the short-term until the recipient can form antibodies in response to the vaccine, a type of active immunization. In a previously unvaccinated patient, the immunoglobulin should be administered on day 0 (the day of the initial visit), and the vaccine should be administered on days 0, 3, 7, and 14. 1. Centers for Disease Control and Prevention (CDC). Recovery of a patient from clinical rabies—California, 2011. MMWR Morb Mortal Wkly Rep 2012. 2. Hankins DG, Rosekrans JA. Overview, prevention, and treatment of rabies. Mayo Clin Proc 2004; 79:671. 3. Manning SE, Rupprecht CE, Fishbein D, et al. Human rabies prevention—United States, 2008: recommendations of the Advisory Committee on Immunization Practices. MMWR Recomm Rep 2008. 4. Massachusetts Department of Public Health. Management of patients potentially exposed to rabies. 2011.
http://www.mass.gov/eohhs/docs/dph/cdc/rabies/attach-2-exposure-management.pdf. Accessed March 26, 2017. 5. Boland TA, McGuone D, Jindal J, et al. Phylogenetic and epidemiologic evidence of multiyear incubation in human rabies. Ann Neurol 2014. 6. Cabasso VJ, Loofbourow JC, Roby RE, Anuskiewicz W. Rabies immune globulin of human origin: preparation and doseage determination in non-exposed volunteer subjects. Bull World Health Organ 1971; 41:303. 7. Centers for Disease Control and Prevention (CDC). Human rabies prevention—United States, 1999: Recommendations of the Advisory Committee on Immunization Practices (ACIP). MMWR 1999.